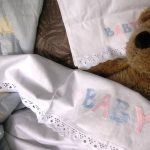 Beautifully crafted Battenburg Lace Baby Crib sheet and matching pillow case…functional and pretty. 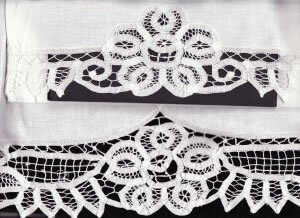 Originally in use by Catholic clergy, the production of lace became popular in the 16th century. 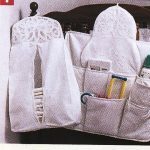 Lace represented a gift of labour, or a labour of love. It is no surprise that Lace conjures intimacy and inspire elegance. We create this pure and white Battenburg Lace personal product line, beautifully crafted by experienced artisans. The magic of intimacy and romance will travel from your home to cottage, to church, to wedding, to honeymoon vacation, to anywhere your heart desires. The best part is: Luxury at a price you can afford! Limited quantities. 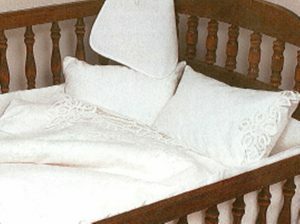 A close-up version to demonstrate the beautifully crafted Battenburg Lace Bed sheet (Bottom image) and matching pillow case (Top image). It is All in the Details, the lace brides and lace bars are hand crafted in a variation of twists and spiders to add interesting finishing touches. 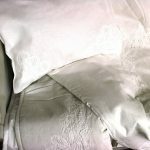 Woven of pure cotton natural long staple fibre of premium quality. Sold as 3-pieces complete set. All measurements are approximate with a variance of 5-10% deviance.